← Ladies’ Undergarments: Bloomers, Pantaloons, or Drawers? This is the second in a series of historical costuming books by Jean Hunnisett. It covers women’s dress from 1500-1800. (The first book covers the Middle Ages-1500, and the third book covers 1800-1909.) 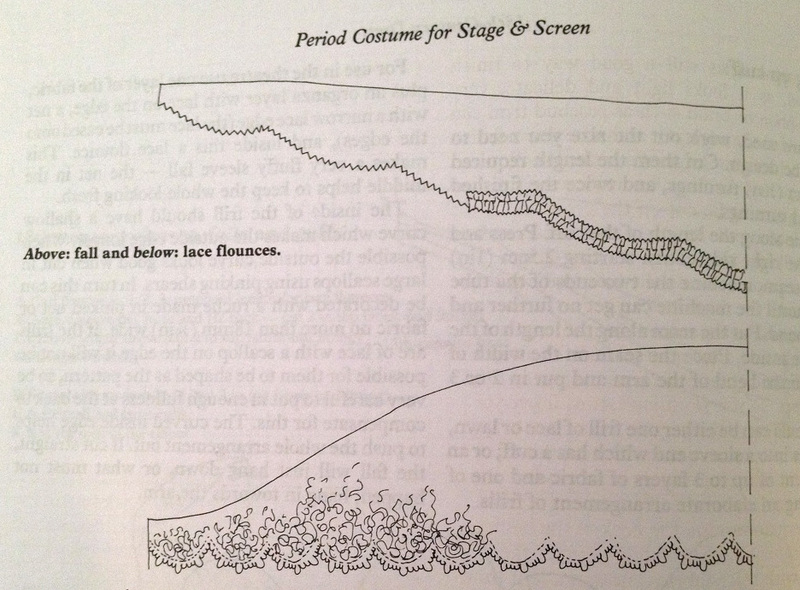 It includes patterns and instructions for making costumes that appear to be historically accurate—however, it’s aimed at costumers for stage and screen, so modern sewing techniques are used. Also, the book is intended for expert dressmakers, so you might have difficulty assembling the patterns if you’re a novice. But don’t let that discourage you. All three of these books are treasures! I love how thorough this book is. It walks you through every step of designing and sewing a historic costume, from creating the right undergarments and getting the silhouette right, to fitting the mockup, to embellishing the gown appropriately. 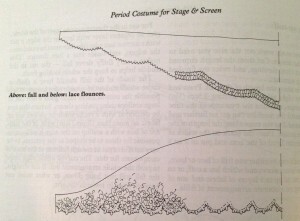 It gives directions on how to drape your own costumes, but it also includes a great many patterns for your use. Beginning with the 16th century, you’ll learn how to make Tudor and Elizabethan corsets and farthingales, along with dresses, ruffs, partlets and surcoats. It shows the distinct changes that occur in fashion as time passes from the 1500s to the 1600s and the 1700s. For the 18th century, you’re taught how to make a pair of stays, along with pocket hoops, panniers, and bum rolls. This period is all about decoration, and the book does not disappoint in that regard. It explains how to make ruffles, swags, and puffs, how to shape your sleeve cuffs, and add lace flounces. The details come from gowns found in museum collections and period portraits, so they’re historically accurate. I also enjoyed the many illustrations. There are a few black-and-white photos, but nearly everything is demonstrated by means of clear, concise sketches. These neatly illustrate the sewing techniques, while being lovely in their own right. My biggest complaint is that the directions given for assembling the patterns aren’t as detailed as they could be. It assumes a great depth of prior sewing knowledge. 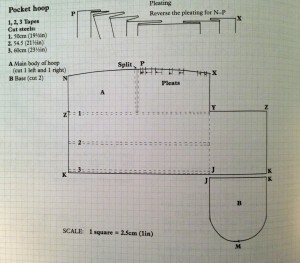 When sewing my first pair of pocket hoops, for example, it took me awhile to figure out exactly how the pattern should be assembled. 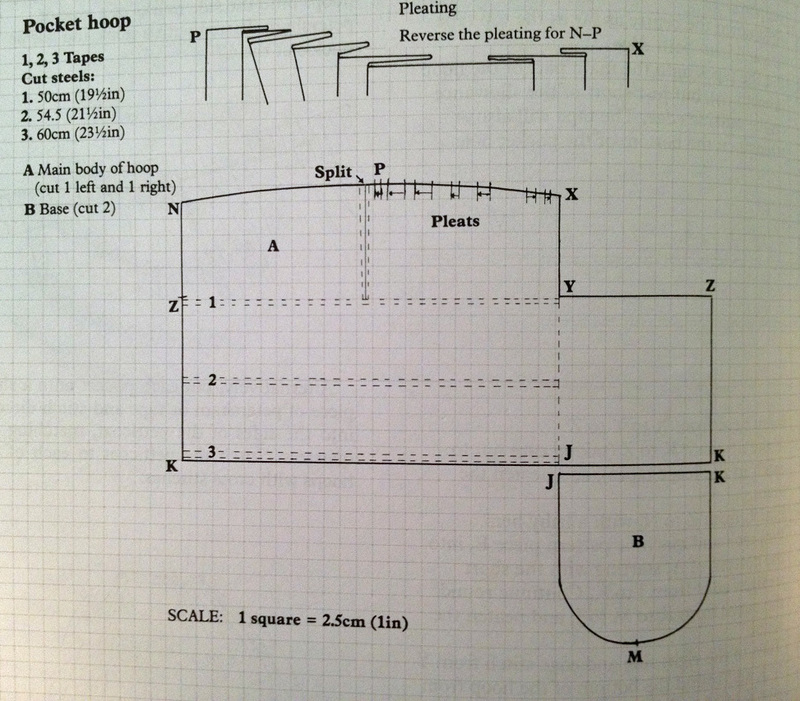 It didn’t give clear instructions for finishing the edges or neatening the seams, so my pocket hoops didn’t look as professional as I would have liked. 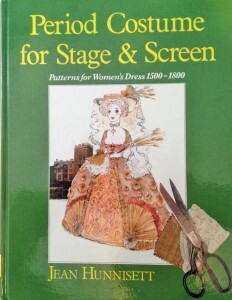 If you are serious about historic costuming, you’ll want to have Jean Hunnisett’s books in your library. They are not intended for novice dressmakers, but if you have patience and give yourself plenty of time to work out the directions, you’ll probably be okay. Always make a mockup—not only to ensure a perfect fit, but to work out the kinks in the pattern assembly, as well. This entry was posted in Thursday's Book Reviews and tagged 18th Century, Book Review, Renaissance. Bookmark the permalink.